In an effort to line the walls in everything zombie we’ve stumbled upon Atomic Monkey Design and their zombie posters*. My favorite, although a rather morose message, is the “Better One in the Head than the Living Dead” poster shown at left. Is it wrong that I immediately envision hanging this above my bed? Probably, but for a zombie lover it’s too cool a phrase and artwork to pass up. Reminds me of a car I once saw driving that had a “redead the undead” bumper sticker. I was so shocked that someone a) created and b) bought such an awesome zombie-related item that I almost got in an accident trying to get another look at it. For those of you not on Fright Catalog’s mailing list; their spooktacular savings sale has been extended until 3/20/07. Get up to 25% off by entering in the coupon code FCSALE during checkout. I suggest some Gortraits (gruesome morphing portraits) to add the extra creepyness that your hallway walls have been moaning for. 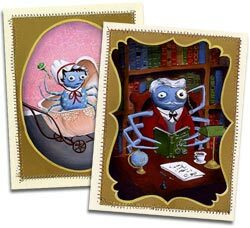 Finally, these amazingly illustrated Spider Portrait cards definitely fit the “creepy, crawly” bill, and would make a great surprise for a fellow Halloweenie. Imagine waking up one overcast March morning, cursing the calendar for separating you from Halloween, and then finding a member of the Spider Family in your mailbox. The images are actually sewn onto card stock, which looks amazing, and makes them ideal for framing if you can’t bear to part with the cards. Available from the awesomely named Head Explodie. Subscribe to comments with RSS or TrackBack to 'It’s March, Let’s go Halloween Shopping!'. Just wanted to say thanks a lot for the plug! Yay for the year of the zombie!